Kristin Henshaw has taught Japanese and Language Arts courses at Bainbridge High School for several decades. 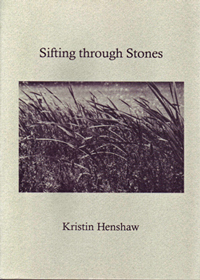 She is the author of Sifting through Stones (1999), a book of verse with photographs by fellow poet Sue Hylen. Henshaw's poetry has been published in numerous magazines and journals, including Calyx, Crab Creek Review and convolvulus. She has also had feature articles published in The Bainbridge Review and the Yomiuri newspaper in Japan.